Soooo, remember when I shared this woven rag rug tutorial with you and I gave my solemn vow to hunt down other good rug projects? Well, I can hold my head up high because as of today I have kept that promise. No applause, please. You’re all welcome. Take a look at what some rope and fabric strips can become! Take the beginning of your rope and wrap the end with one of your fabric strips. There’s no special way that you need to wrap the end; just make sure the tip is covered with the fabric, and then start to wrap the fabric from either right to left or left to right (depending on which is more comfortable for you if you’re right- or left-handed). Use your sewing machine to sew straight down the rope a few inches to hold the wrapped end in place. I would suggest using a heavy needle, like a jean needle, since you are sewing the rope as well as the fabric. Keeping your machine needle in the rope, continue to wrap the rope with the strip at a slight angle so you are continuing down the rope (instead of just wrapping the same spot). Once you get a foot or so of wrapped rope, sew straight down the middle of the rope until you reach the end of your wrapped rope (I put my sewing machine on the longest stitch length). Continue this process until you have 10-15′ of wrapped and sewn rope. I switched my fabric every time I got to the end of a strip and alternated between my different patterns. Just wrap the beginning of the new strip overtop of where the old strip ends so the rope never shows through. Try and switch up the pattern rotation every so often to keep the patterns looking random overall. When you get to the end of a pack of rope, just place the beginning of a new rope right after the end of the old rope and wrap around them as you normally would. Once you sew straight down that spot, it will join them together. Take the beginning end of your wrapped and sewn rope, and make a small clockwise coil. Once you coil a complete circle, use a medium to long stitch length and the widest zigzag setting to sew between the ropes and join them together. Keep turning the coil and joining new rope to the coil until you reach the end of your sewn and wrapped rope. Once you reach the end, continue the process of wrapping and sewing straight down the rope until you get another 10-15′ sewn, and then zigzag stitch that rope onto your coil. And you know what? That’s pretty much it. You just do that over and over and over until the rug is as big as you want it to be. To keep the sides from curling up as you go, try not to pull on the rope you’re joining to your rug. Just lay the rope next to the coil as you sew without either pushing or pulling on it. Once the rug gets to be too big for the table your sewing machine is on, you’ll need to add another side table or desk next to your sewing machine to keep the rug flat and even with the sewing machine platform at all times (this really helps it not curve up like a giant bowl). I had to add a few books, etc., under the legs of the second table to make it the right height. Once it got too big for the desk, I moved it to the dining table and finished the process there. You can see I took a side table and put a box under it to make it the right height. Definitely a makeshift solution, but it worked! When I was done with the rug, I did still have some slight waves that wouldn’t lie flat. To fix those, I placed the rug on top of a carpet, gave the rug a good spray of water with a spray bottle, and ironed the rug with my iron on the highest steam setting. Once it felt damp with steam, I put some heavy books on the trouble areas and allowed the rug to dry. Goodbye, waves! I will say, though, if you feel the edges are getting too curled while you’re sewing, it’s best to just use a seam ripper and rip those rows out and resew them while not pulling so tight. I had to do it a few times, but it was worth it in the end. If you’re not sure if it’s getting too wavy, you can do the steam/iron trick before the rug is finished, and if the waves disappear, then you’re good; if not, you probably need to redo those rows. To finish the rug, use your fabric strip to wrap your end of the rope similar to how you wrapped the rope at the beginning of the rug (just make sure the end of the rope is covered), and sew down the middle to secure. Using the zigzag stitch, tuck the end of the rope under your rug so it disappears from sight, and sew over it to secure. As you can see, I ended up with a rather sizable rug (55″ wide!). I’m actually considering continuing the rug and seeing just how big I can make it, but until I get that second wind of rug sewing strength, it’s going to hang out and look cute in our kitchen. Credits // Author: Laura Gummerman, Photography: Laura Gummerman and Sarah Rhodes, Project Assistant: Alex Wade. Photos edited with Stella from the Signature Collection. Love it! Not sure my sewing machine would cope with it, but I love the result! The possibilities with other materials are awesome! You can be happy Laura, it’s fantastic ! one in browns would look awesome, like the rings of a tree. This is awesome! I have a ton of scraps calling out to me now. I loooove these kinds of rugs! I always figured they’d be pretty easy to make, but just didn’t know how. Out of curiosity, what do you do with all your old DIY projects that don’t fit in with your current decor anymore? I have a problem with hoarding all my old creations and would love to know what y’all do with yours! This is ahhhhhhh-mazing! I’m wanting to make a rug for our living room – this was the perfect inspiration. Thank you!!! I used that cross hatch print to cover some chair cushions in my living room and a B & W rug has been on my radar since then. I’ve thought about painting a rug but I love this one so much. It looks like such quality work, too. Great job! If I manage to get one complete this summer, I’ll let you know how it goes! another to add to my huge list of reasons I want a sewing machine!!! The rug is amazing, I;m very happy with this tutorial!! What a work!!! Congratulations Laura, it looks fantastic!! Wow, I really like that! I’m moving house soon and have a small budget for decorating so this came just at the right time! This looks amazing! Thanks for sharing — what a great DIY. Pinning this! So freakin CUTE! I know this post is for the rug. It’s great! But where are your overalls from? I’m dying. They are amazing. Coasters and hot pads for the table would be adorable in this too, and a great scrap-busting project! Wow, I can’t believe how professional that rug looks!!! I love this idea! This is added to my to-do list! Just amazing! Absolutely worth the time. It’s so unique too. Love it! I love this rug! Absolutely stunning and so impressive! I would love to make a (small) one for my own kitchen. I will be sure to pass this on to my family, as I know they too would LOVE this! What a monumental project! Great work. It looks wonderful. Amazing idea, thank you. I could try! This is probably one of my favorite DIYs that has been featured on A Beautiful Mess yet! Unfortunately, it looks as thought it might be a bit too complicated for my beginner level skills! Still, bookmarking and might attempt this one day! 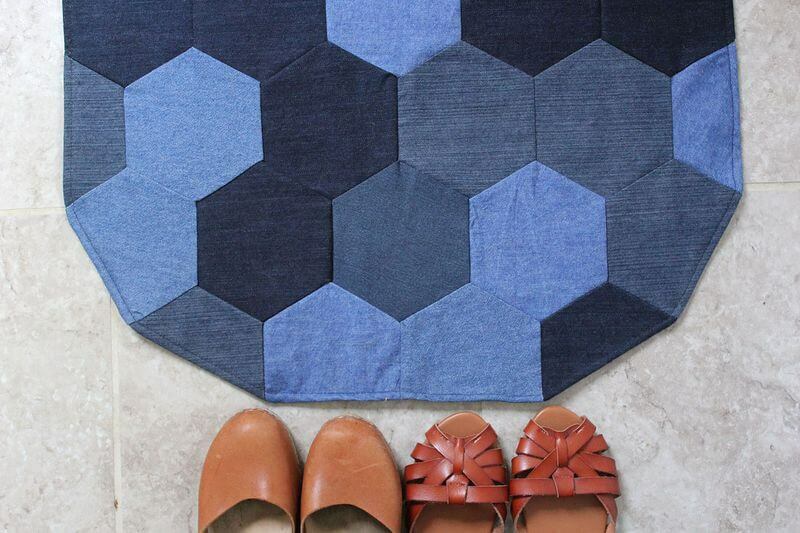 How much fabric did you use to make each size of rug? About how much yardage do you think you used for a rug this size? I don’t have a scrap stash to speak of, so I’ll be buying some new fabric. YAY! It turned out great Laura! And looks awesome in your kitchen! I’m wondering how your sewing machine held up with all this. Did your needle ever break? What a fun rug! And such a great project! Thanks for sharing! Um, where did you get those rad black overalls? I want a pair! The rug is FAB too!!!!! Wow. This is incredible! Such a talented lady! This is gorgeous. I can not wait to revamp our kitchen with this technique, but I would also like to know if you’ve considered placing something under the rug to make it more cushy? I spend a lot of hours washing dishes (no dishwasher in Hawaii…but I live in Hawaii, tee hee so no complaints) and I think this rug could be fab under my feet! What would you suggest to add a little more comfort? I am glad to see this!! It is what I need to do now!! Great Idea! I really want to make one for my new room! This is crazy cool. I am so impressed by how simple it is compared to what the final product. Ok wow, I’m seriously impressed. Absolutely gorgeous. Pinned for later. Yep, this is amazing. I would never have the patience (or time! blah) , but it’s just amazing!! I need to make one for my daughter’s room! This is awesome. How much would you say you spent on all the supplies? WOW! That is a DIY to be proud of! If I get ahold of some good fabric, I may try it this summer. This rug is awesome!! And I’m loving Laura’s posts lately!! you guys are very creative, I love that! Very cute! I would LOVE to see a tour of Laura’s home! WoW! This is pretty great! I also love her overalls with heels. OOOH you could also make chair pads in the same way and put ties on the back sides by making binding in a matching fabric ! I love the rug and the whole idea! really amazing! it seems so affordable… I might try my hand in doing so! This is definitely the kind of project I love, something kind of mindless that does kind of take forever but with big impact. I’ve spent 6 hours sewing crepe paper that only lasted a few hours at a party, so I think this is doable for me. 🙂 Love it! This is sooo beautiful! ♥ Thank you so much for sharing!! I can definitely see this as a perfect student project – will look great brightening up college accommodation! This rug is fabulous! I think the effort it so worth it! Oh my god i LOVE it! Have to buy myself a sewing machine now..
i love your rug DIYs! i really wanna try them all as our house is mostly tiled so we get chilly toes! Wow, I can’t believe this looks so fabulous! You are really talented! I love it! I’ve made weaving-type rugs that look similar before, but could never get those as large as I’d like them to be! This is amazing AND would be super cost effective vs. buying a rug the same size. Thanks for sharing! Just a side note: it would be really great if you’d share your sources when you’ve researched how to do new projects like this. It not only gives credit to those who’ve inspired projects, but would also help readers get even more ideas for their own variations. Oh man this is good. Awesome job! this is seriously great! what a fantastic job.. so inspiring! Thanks for your help Alex, you’re the best!! I love the tutorial here but I also love your strappy black heels! Where are they from if I may ask? LOVE the rug! After the first tutorial you mentioned, I’d hoped you’d do a circular one. Also, LOVE LOVE LOVE the shoes! Where’d ya get them? This is soooo beautiful thanks for sharing, just love it. Wow what an amazing rug! In your opinion what would be the best sewing machine for someone just starting to sew?? This is amazing!! What a great project! Thank you for showing how to do this. Your rug looks fantastic! Where can I get those adorable black shoes?? This rug looks fabulous. It feels good to showcase something in your home you made yourself. I love the fabrics you chose because they really compliment the existing kitchen decor. I loved everything, especially the black overalls!! Who made them? Thanks. How would you wash a rope carpet! I love this idea! Such a cute project! Great job!! Wow! I love it. I am been thinking about trying a project like this. Now I want to try it! Hi Laura, this is beautiful! A question though, in your opinion, how do you think a beginner level sewer would do with this project? I’d love to give this a try! Fabulous! Maybe one day I’ll be brave enough to try it! Are those leather overalls?! I love them! Where did you get them? Uhhh! This looks amazing…. I need to do one of those maybe as a birthday present! Wonder if it would look good in color a few different color patterns? What do you think? This rug is beautiful! Can you tell me how you plan to clean it? Thanks for sharing. SO CUTE! i want to go make one now!! Forget the rug, Laura (even though it is amazing), where the heck did you get those overalls?? I’m drooling over here! What kind of sewing machine are you using for this? I love this rug, I think I’ll try upcycling some old shirts into one. I might try making a basket with the same method. Thanks for the inspiration! Wow. Love this.. You rocked in making this rug.. I believe the different pattern of all the black and white fabrics makes the rug looks like stars on the floor. Love those rugs!! This one is to die for… I have a couple similar in my kitchen. Buuuutttt…. Girl where are those Overalls from??? They are soooooo Awesome!! Awesome project! What sewing machine is that (and do you recommend it)? Mine kicked the bucket today and the repairman said it wasn’t worth fixing – time for a new one! This is adorable — is there any way I could use this method to create a half circle shape? Hi! I have bought the material and rope for making the project, but I’m having a real struggle with getting my sewing machine through the rope without completely shredding the stitches up (it looks like a massacre!). My machine is a very good one so I can’t work out why it is doing this…did you have that problem? I’m so excited about this project! I love it!! I’m going to make one except with a splash of red! I love the rug but where are the cute overalls from??? My machine wont lift up high enough for me to put the rope under it. What kind of machine do u use? I wonder how hard it would be to do a long narrow runner? How hard would it be to do a long narrow oval, like a runner? How did you get the rope to fit in your machine? Mine is vintage and I’m not sure if I’ll be able to do it or not. I’d absolutely love to make about a billion of these! Wow, that is SO beautiful! I love the texture and fabrics you used!! That is totally awesome. Thank you for the tutorial! i need those shoes…where are they from? Great rug….but those overalls! I need them! Where from?? What was the thickness of the rope please? I’ve got to be doing SOMETHING wrong because my bobbin keeps catching or over lapping or something and then I have to pull it out and cut the thread. But as soon as I thread it through the rope, IT DOES IT AGAIN! ahhh! I don’t know what to do! 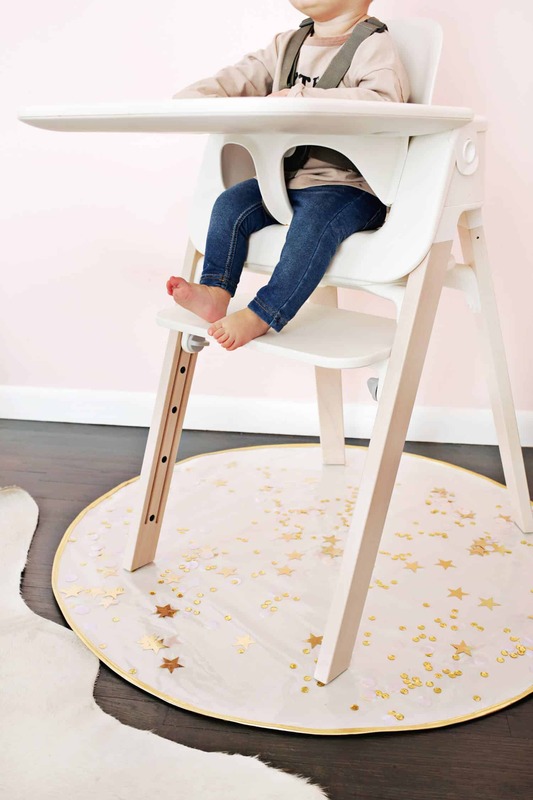 I’m going to make one of these each for my girls and one for my kitchen starting this week! I’m doing it similar to the bowls though, I’m not going to sew down the cord, just wrap and zigzag it onto itself as I’m coiling. I wanted to make this after I saw fabric bowls, but wasn’t sure it would work! Thanks! Just a heads up for anyone who is reading, You only need ONE INCH of fabric strips. 2 inches is a waste of fabric and it is MUCH harder to wrap. You can get the wrap tight with using 1 inch strips and wrapping covering half of the strip. Also, it is a HUGE overkill to sew the rug down the middle first. Huge waste of time. If you wrap the fabric around the rope tight, and pin it at the bottom, it won’t unravel and you can sew to that point. So instead of sewing down the middle then zig zagging it together, DO NEITHER. Use the 3 zig zag stitch. It makes it much more secure. Using the widest zigzag and only a 2.5-3 for the stitch length. This way you go straight into making your rug rather than having to go back and forth and back and forth between sewing it down the middle and the normal zig zig. You’re machine should be fine! I just started making one again and I have had problems!!! 2. Instead of straight stitching down the middle, just go right into coiling it and attaching it with the 3 zig zag stitch (longest zig zag and 2.5-3 for stitch length) instead of sewing straight down the middle first. MUCH easier this way and you get it done much faster and it looks better! 4. Release some tension on your pressure foot. I love this! I also adore your kitchen. Any chance you want to share your paint color info? I’m in love with it. I was wondering can’t you just make a tunnel with the different fabrics and put the rope inside? When your wrapping if your not stitching in the middle the whole time than where are you stitching? As an experienced weaver of rag rugs I can tell you this isn’t a woven rug. It is sewn not woven. Achei lindo,gostaria aprender em português. Grata. Just bought an adorable old house in a small cow town in Wyoming. I have been looking for rugs to put in the kitchen and dining room to decorate them with a farmhouse look and feel – cows, pigs, sheep, chickens, eyelet, white milk pitchers, milk cans … This rag rug tutorial is perfect for the kitchen!! My search is over! But is there a way to make one of these rag rugs into an oval shape for underneath my oval dining room table? Can’t tell you how excited I am about this rug! Thanks for sharing, girls! Wow, this is beautiful, I love it and will love to try my hands on it. I think its worth the effort…List of items to get-A sewing machine…I must appreciate you for the tutorials. I am in Nigeria viewing this now and new on the DIY trend. Looks absolutely beautiful I love white and black together great job. This has been on my to make list for 5 years now, and I can’t wait to finally get started but I just now wondered if it doesnt fray too much? Oh… I thought it was handwoven… nevermind, I guess. I have a question. What did you do to deal with the unfinished edges of the strips of fabric? What kept them from unraveling over time? Did you sew a finished edge before wrapping the rope?